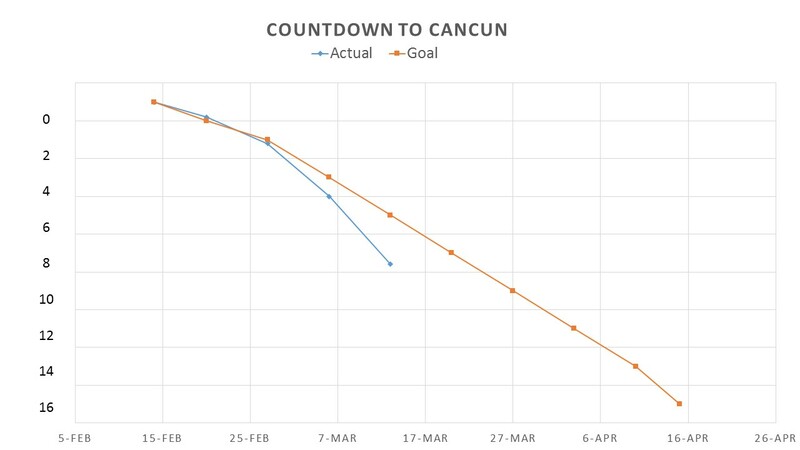 Just over a month until Cancun. WOO HOO! I am down an amazing 3.6# this week and 8.6# total since Valentine’s Day! Well, I’m not surprised. I worked HARD on my workouts and especially my nutrition. Stayed on track with my commitment to only enjoy adult beverages once a week and food plan was almost perfect with 3 modest meals and 2 snacks daily. I’m continued living proof that the 21 Day Fix Meal Plan WORKS! OR what I do now: 6 greens, 5 reds, 3 purples, 3 yellows, 1 blue, 1 orange, 4 tsp. Much easier in my opinion and keeps me sane. If you want simple structure, easy to follow portion control, daily exercise, and free accountability and support – DON’T JUST READ my posts….send me a message and let’s get an action plan in place for you! !